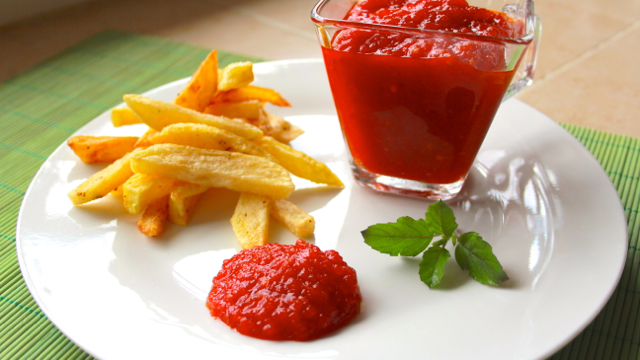 Very simple and very tasty homemade Ketchup! Better than anything you can buy in the stores. This recipe uses no onion, garlic or vinegar making it a nice Sattvic sauce to accommodate many different dishes! First place the tamarind and 3/4 cup water into a pot. Bring to a boil and then turn off the flame and let sit until cool. When the tamarind water has cooled, squeeze the tamarind through your fingers to get all the flesh off the seeds. Then set aside. Next you will need 1 kg of fresh tomatoes. One kg for me was around 18 small tomatoes like you see here. Cut the tomatoes in half and place in a blender along with the fresh ginger and green chile. Then place the ghee into a large pot along with the tomato puree, sugar, hing and salt and set the flame to medium high. Using a colander, pour the tamarind liquid into the pot as well and discard the seeds and shell. Note* If you want a more creamy ketchup, like you find in the stores, run the tomato puree at this time through a colander and squeeze all the tomato juices through until you have the skin and seeds left. Use the tomato liquid for the ketchup only and discard the skin and seeds. Continue following this recipe from here. Next we are going to make a small pouch of whole spices using a tiny cheesecloth and string. Place all the spices inside the cloth. Then grab all the edges and tie a string around it to hold all the spices within. Then add it to the tomato sauce and continue cooking. We are going to continue cooking down the mixture. The sauce will thicken as the water evaporates. After about 15 minutes of cooking, reduce the flame to medium low, or when the sauce starts to splatter. The Ketchup is done when it looks like this! Serve with homemade French Fries or Paneer Nuggets and you are ready to offer to Kṛṣṇa with love and devotion!